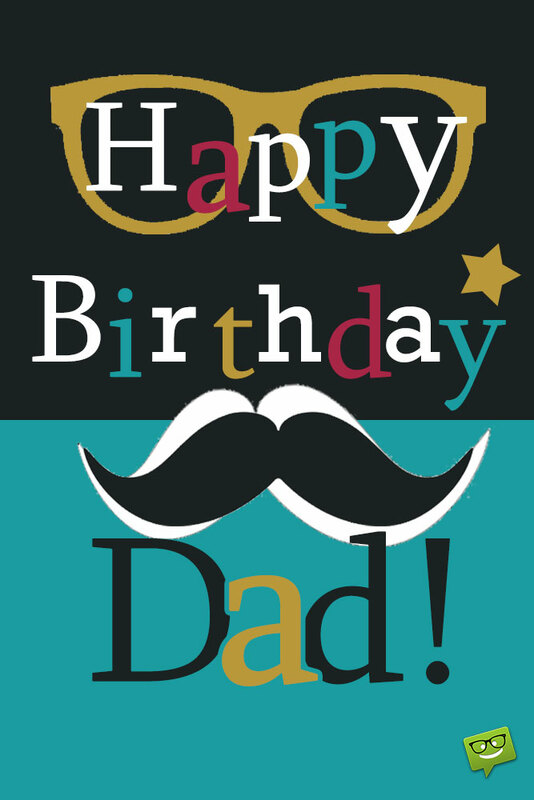 Looking for posting birthday wishes for dad on your FB wall or Whatsapp? The bond we have with our dad’s is so special. And the look on your Dad’s face when you send him a simple and lovely birthday wish is also very precious. So here i have collaborated a list of Birthday wishes for Dad to use on his special day. Be it a card or message or a quote we focus on making him happy via our words. Wishing dad on his birthday is a mandatory thing. Because out of everyone he will be expecting your wish the most. Dear father, I know you are getting older, but I never want the fun times we had to end. I miss the early days when you were all I cared about. May this birthday just be the start of more fun times. I love you daddy; happy birthday! Dear dad, I want this birthday to be the best you ever had. Every year is different, and I know that you have had a lot of them. Though, you have had many chapters in your life, each with their own birthday, I know you love these days the most. Thank you for always being there. Daddy, this year for your birthday, I wanted to write you a poem: Roses are red, violets are blue. But no guy loves me as much as you. Boys will come, and boys will go, yet still their love, I’ll never know. Through the years, I’ll come to find, it’s always your love, that will always be mine. I love you daddy. Dear daddy, you are a handsome man, and you are so strong, too! Thank you for being my daddy. Have a good birthday. Dad, I know we don’t talk all too much, even though you try to talk to me. But I’m still glad you are my dad. I love you a lot, and I don’t know what life would be like without you, even if I don’t always show it these days. Thank you for always being around. I hope you have a wonderful birthday this year. Hey dad, I thought I’d take the time this year to remind you why I love you. First, you always spend time with me whenever you can. You take me fishing, to the park, to stores and to special events. I love it when we can go camping. Second, you always find a way to make things work, even when things aren’t going well. Third, because you are my dad. You have been there for me since the day I was born. Happy birthday dad; I love you. Dear dad, you are my hero, and I look up to you everyday. I’m so glad you do everything you can for all of us. I love you dad, and I hope you have a great birthday. Time to use these birthday wishes for dad and Wish him by using one of these and make sure u stand there to see the smile and pride on his face. What is love if we cannot bring that smile on our loved ones isn’t it!! Looking for posting birthday wishes for dad on your FB wall or Whatsapp? The bond we have with our dad's is so special.